In partnership with EVA 2014 David Horvitz was nominated by curator Bassam El Baroni to take up residency living and working onsite at IMMA. Just before Horvitz arrived in March it was revealed he would remain on California time for the duration of his stay. With Agitationism as the theme for this year’s biennial it wasn’t a surprising twist and might be a handy way of avoiding jet lag! Rising around 3pm and retiring in the small hours of the morning there was rarely an opportunity to have a conversation with Horvitz, he stayed in touch by email giving updates on plans to visit various sites of interest for his time in Dublin with all planned pursuits commencing after his ‘breakfast’ in the afternoon. To add to the confusion, in the middle of his residency the clocks sprung forward to summer time, adding another hour of distance to the daily routine. Around the corridors of IMMA word spread quickly of this guy who no one was going to meet! a scenario which generated a lot of curiosity, poetic resonance and humour with people. Now that some more time and distance has passed and as part of IMMA’s group exhibition Unseen Presence, I emailed Horvitz the following questions, curious about his unique residency at the Museum. JH: Did this experience affect your sense of time? DH: I was trying to stay on the time of my clock, but my body was trying to adjust to the light of the day. So I had this kind of split experience. Sometimes when it was dawn in Ireland, but time for sleep for me, I would feel my body start to wake up because the sky was becoming light. JH: What was it like being a dusk to dawn fluxus artist? DH: It was lonely; I spent a lot of time with foxes, security guards, and trees. JH: Where did all our spoons go? DH: I sent them to Helga at the New Museum in New York. She maintains my stolen spoon collection. 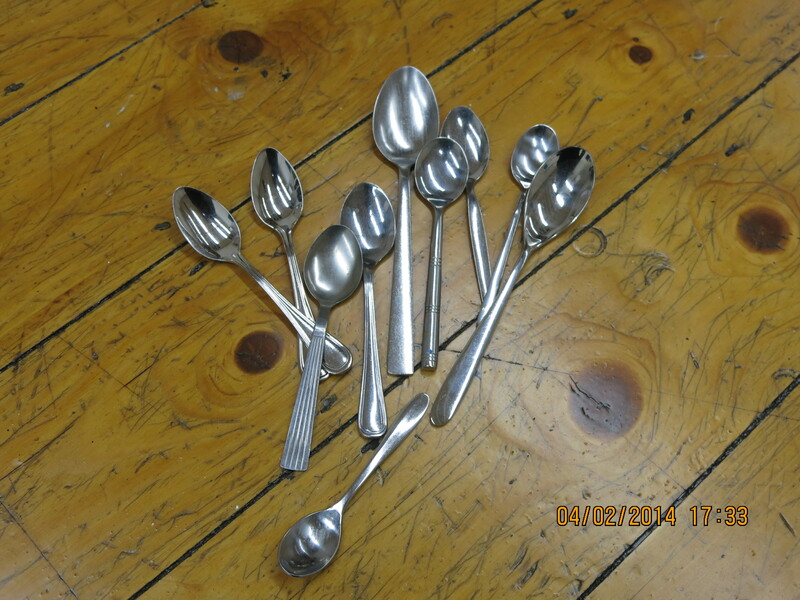 I have a large collection of spoons that have been stolen, mostly while I’m traveling. Helga has a giant box of these. Sometimes I mail them to her, like I did the ones from Ireland. But sometimes I go to the reception of the museum and hand them to security and tell them to give it to Helga. No envelopes needed. JH: You mentioned how efficient Dublin airport is, how do we compare? JH: We haven’t found your red trousers, any clues, did you get them back? DH: Someone has them somewhere. Maybe in Limerick. Who knows? Maybe someone is wearing them. If you see someone wearing them, make a photograph for me. If you go to my hotel room I stayed in in Limerick I left a bunch of things under the mattress of the bed. Go get it. JH: When you arrived some of your first observations and questions were about the blossoms, where our botanical gardens are located, the sundial in the courtyard, the clock tower and if it has a bell?, how near the sea is & where to get a good all day breakfast. What resonance and continuity, if any, did these observations of seasons, time and distance and the upset of ritual have on your work in Dublin? DH: I came in spring, and I always like to follow the progress of spring where I am. I travel a lot, so I am able to see what stage a place is at. For example I remember seeing Forsythia when I landed in Dublin, but none of the Forsythia in New York had come out yet. 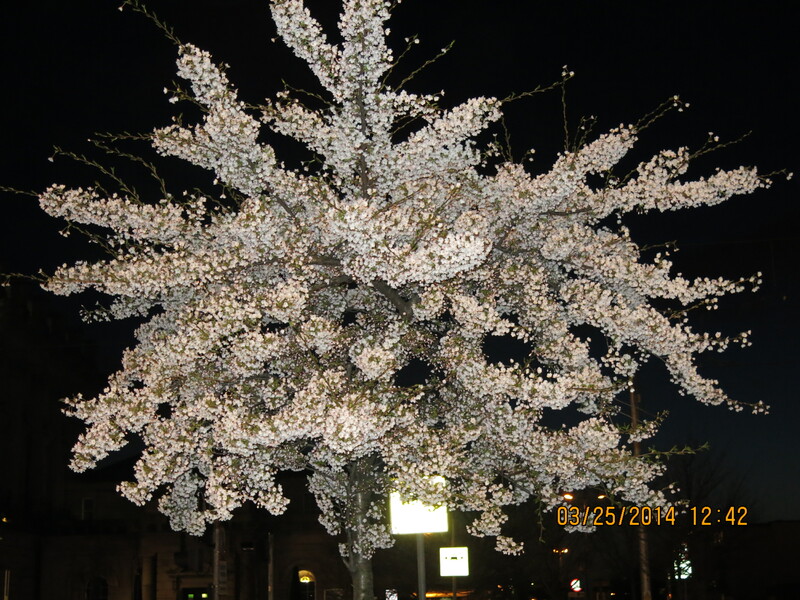 And there were cherries and magnolias in bloom already. I was making a slide projection, so all of this entered into the piece. These were visual observations as I wandered around Dublin… And there were times I’d come across indicators of time and distance: maps, sundials, closed shops, newspapers, clocks, etc… So they ended up as things to meditate on. The Botanical Garden itself is a kind of disrupted space, or a geographical autonomous space. Different climates exist as little bubbles, and plants from different parts of the world can survive there. This piece was about a kind of dislocation. Or a non-time. 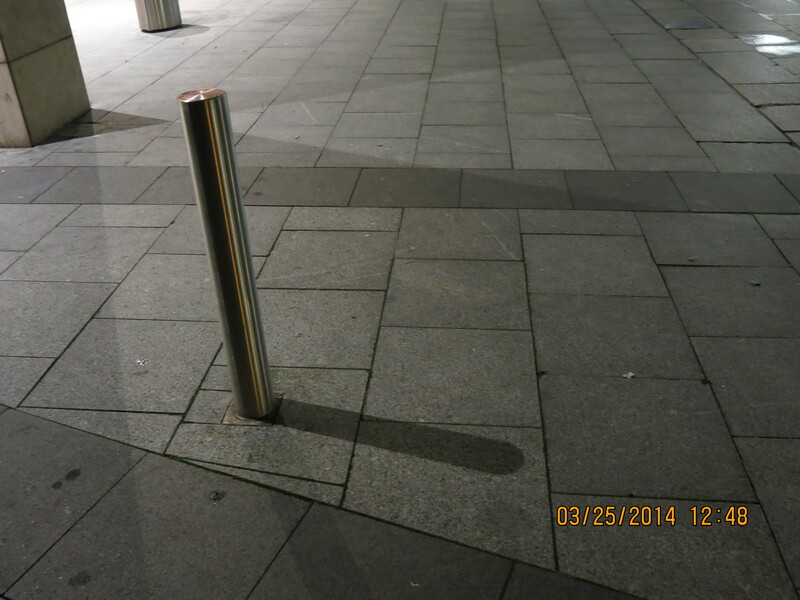 I like to look at the shadows cast by poles at night from street lights. They are a kind of sundial, yet the lights don’t move like the sun does. It’s like this non-time. You are at night, but it’s like it’s still day. Looking at the stars was once a way of telling time, and with light pollution you lose site of the night sky. And so at night you lose this sense of telling time, and the shadows stand still. I’m always looking for a bell to melt. I like melting time. JH: Would you do it again? DH: I want to do it in every time zone. And the final piece would be to experience California while living on California time. JH: What surprised you most about this project? DH: That if I wanted to find a fox I could. Are foxes on California time? 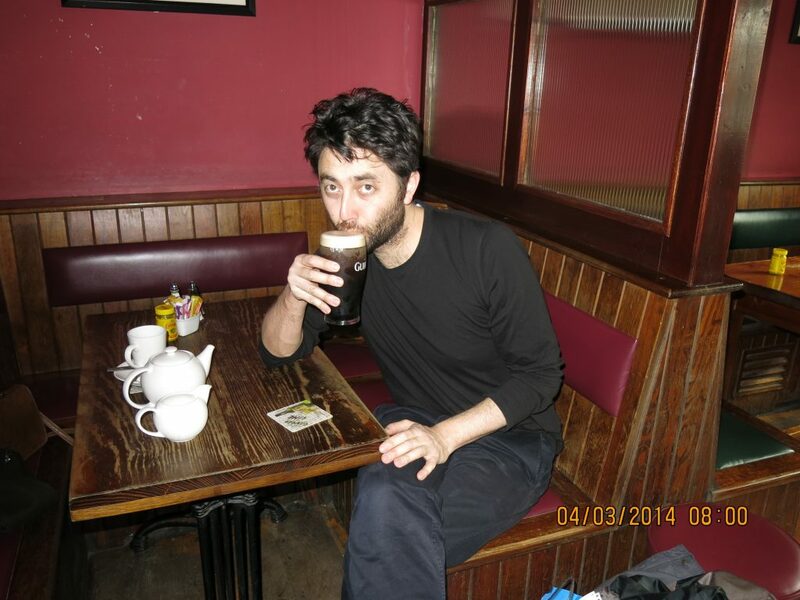 8am pint in the Gravediggers enroute to Dublin Airport ……………….. This text is a contributing element to Unseen Presence, a group exhibition in the Project Spaces at IMMA from 15th July until 24th August featuring various research and studio practices of selected artists on residency at the museum. A photographic triptych whose print quality files are openly downloadable and printable. A kind of print-your-own open-edition. The files can be taken to a photo printer and printed. In his practice, Horvitz grapples with time and standardized measurements, and the shifts that occur when natural phenomena are subjected to manmade systems and vice versa. Recent solo exhibitions include: concurrent shows at Jan Mot, Brussels, and Dawid Radziszewski Gallery, Warsaw; Peter Amby, Copenhagen; Statements, Art Basel; Kunsthal Charlottenborg, Copenhagen; and Chert, Berlin. His work has been shown at EVA International 2014, Glasgow International 2014, LIAF 2013, MoMA, The Kitchen, and the New Museum. Horvitz is represented by Chert Gallery, Berlin.